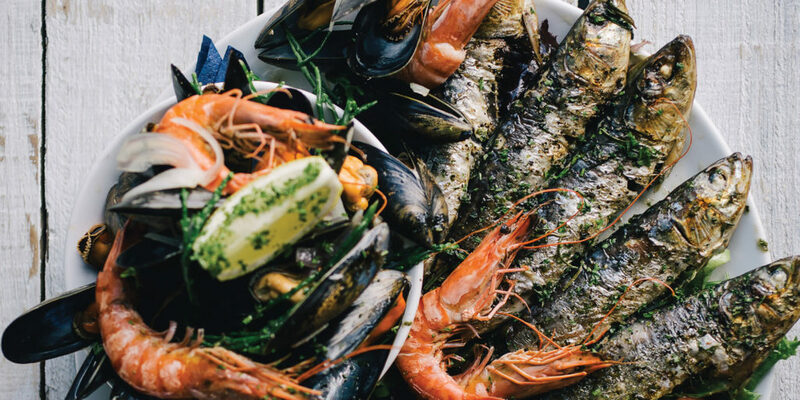 We sample the best of seaside dining at Sam’s On The Beach, Polkerris. Blessed with great weather, M and I thought it would be nice to embark on a little adventure in the camper van. We headed to Polkerris on the south coast, our aim: good food, drink, a wander around the coast in the fresh air and a cosy night’s sleep. We arrived at the beach and were instantly wowed by stunning views over St Austell bay. Polkerris is a beautiful, idyllic, sandy cove with everything you need for a Cornish day out – places to eat, drink and sunbathe, with ample opportunity to swim and soak up the views. There’s also a watersports centre where you can learn to sail, SUP, windsurf and powerboat! We’d arrived a little early, so after a good look around the cove we decided to pop into the bustling Rashleigh Inn. Set in the 300-year old former coastguard station, the inn seems to be a popular location for the weekend wind down. We enjoyed a beer and watched a group of youngsters bobbing about in the sea, before crossing the slipway for our meal. Sam’s On The Beach began life as an old boathouse and slipway 150 years ago, before becoming an RNLI lifeboat station. Now, it’s a wonderfully chic restaurant; the interior is impressive and the open kitchen with woodburning pizza oven allows you to see everything that’s happening, including the preparation of your meal! We were seated beside the huge floor-to-ceiling window, where we could continue soaking up the sea views. M and I are not big wine drinkers, so we thought we’d instead try the Sam’s Pilsner. Thanks to the friendly staff and warm ambience at this charming seaside eatery, we were beginning to feel incredibly relaxed. To start I chose the hot garlic ‘shell on’ prawns. M had the mussels. Both tasted delightfully fresh and full of flavour, and the focaccia bread they each came with was perfect for mopping up the sauce. For mains, M had the surf and turf – a 10oz steak, tiger prawns, shell on prawns and fries – while I ordered the generously sized plate of slow-roasted belly pork, served with black pudding, crispy crackling, crushed mustard potatoes, cabbage, leeks and bacon, finished with gravy and apple chutney. Finally, as if we needed another course, we couldn’t resist a plate of profiteroles and a Sam’s beach Bocca; with such a tempting dessert menu, it’s really quite hard to say no! After the meal we kicked back with another drink and watched the sun set, before wandering back to the campsite. 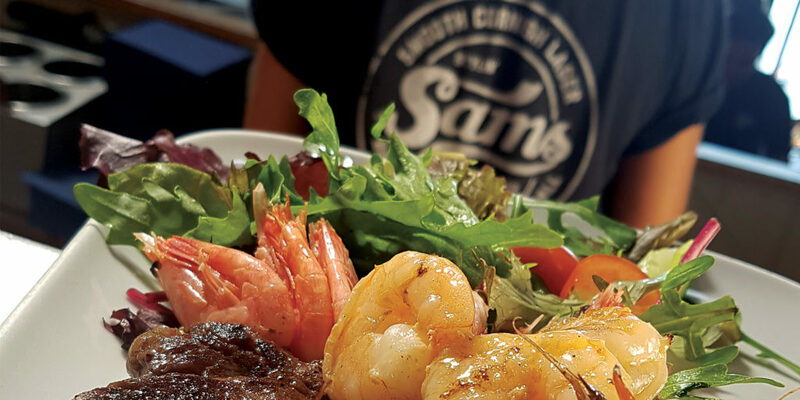 The best part of Sam’s is that there are plenty of ways to enjoy a Sam’s experience, from Sam’s In The City in Truro, Sam’s @ The Bay on Crinnis beach, even Sleep @ Sam’s – a holiday property in Fowey! 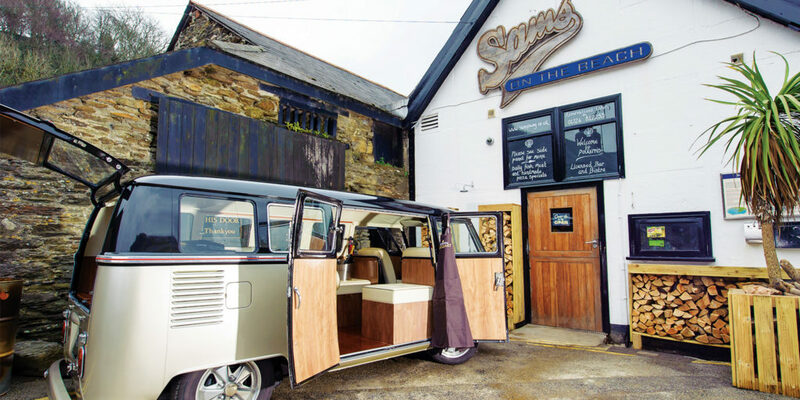 There’s also a Sam’s Diner in St Austell and you can even hire one of the the team’s retro vans for your big event. Indeed, with different delights on offer from each arm of the business, however you decide to enjoy the experience, you won’t be left wanting at Sam’s. "... the interior is impressive and the open kitchen with woodturning pizza oven allows you to see everything thats happening..."
chorizo, parma ham & milano salami with artichoke hearts, red onion marmalade & pickles. Served with salad garnish. Battered & deep fried whole crab, with salad garnish & sweet chilli dip. A classic 1⁄4 pound sams fowey burger, with fried onion & bacon. Wrapped and cooked inside a margherita pizza.served with fries, mayo & salad garnish. Fresh local westcountry mussels served with focaccia bread. Garlic, red onion, white wine, butter & parsley. Chef’s creamy red thai sauce. Mussels, clams, shell on prawns & tiger prawns in a classic mariniere sauce. Chorizo, mussels, clams, shell on prawns & tiger prawns. Cooked in a rich red pepper/tomato sauce with olives, wine, garlic, red onions & fresh herbs. Please see our specials board for our daily fish dishes. Scallops, sardines, tiger prawns, ‘shell on’ prawns (chilled) & salad. With a bowl of mussels mariniere & bread. Seared & roasted in the oven with fresh herbs, roasted garlic & lemon butter. Served with salad garnish and focaccia bread. As above cooked with red pepper & tomato sauce, wine, garlic, red onion, olives, & fresh herbs. 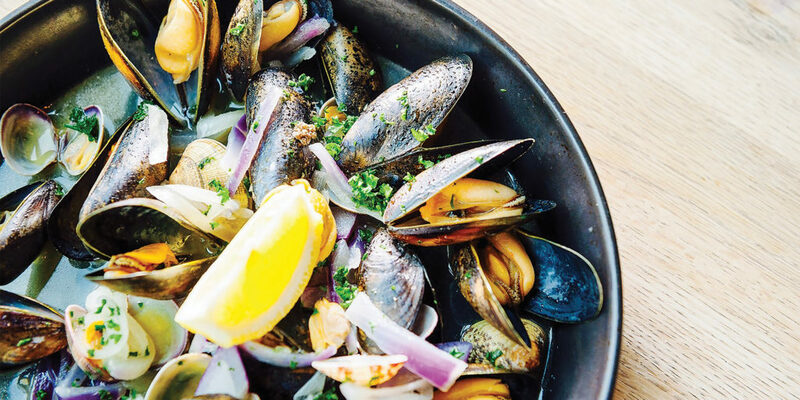 Mussels, clams, tiger prawns, cooked in the chef’s red pepper/med veg tomato sauce, chorizo, garlic butter, wine, thai fish sauce & sweet chilli sauce. Slow roasted belly pork, black pudding & our crispy crackling. With crushed creamy mustard new potatos, cabbage, leeks & bacon. Finished with gravy & apple chutney. Our meatballs are made fresh using quality beef & pork mince. Served with spaghetti, tomato & bbq sauce, red onion & basil. Topped with parmesan cheese. Small fresh pizza base cooked in our wood fire oven. Topped with double cream, syrup, strawberries, toasted marshmallows, dark choco drops, icecream & sams wafer. Ice cream, raspberry coulis, choc sauce, marshmallows, flaked chocolate & a sam’s wafer. Chocolate sauce, raspberry coulis, flaked chocolate, marshmallows and ice cream. Cornish blue, smokey, cheddar, yarg with apple chutney & crackers. Can’t make up your mind? Try our dessert mini platter, ideal for 2. Mini chocolate brownie, choc pot & waffle topped with mini beach bocca.